In The Words Of Kylie Minogue…. Create convincing reflections on your wet rocks by being mindful of the light sources. Light bounces around everywhere - you may have reflections of the light from low on the horizon hitting parts of the rock (warmer), light higher in the sky (cooler/deeper) as well as direct sunlight creating magical Christmassy sparkles. Gotta love that. We've been super busy getting Mark's latest downloadable tutorial ready for you! And at last Tropical Beach is ready! Episode 1 is free. Woot! More new things! We are excited to announce a new partnership with fresh video tutorial platform Curious.com. Get your learning on! It's free to enroll, with more lessons coming soon. Our first two lots of 2-day workshops have filled up. BUT! We're taking expressions of interest for another 2-day workshop on the 13-14th January. Interested? Lindy Gaskill's lovely little blog jumped out at me today. She is inspired by colour, nature, and the connections of energy rippling outward and connecting all things. Her paintings are bright and whimsical and will make you feel happy in your heart. 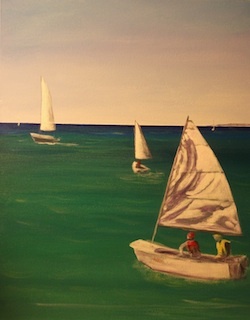 Take 5 and check out her fun painting processes as well as her gorgeous colourful images. Just the name of this blog had me - "Hue Bliss". And I'm not really a cat person, but "Christmas Cat" is just so darn cute! Karen Gillis Taylor is based in Colorado, and is passionate about colour and design. She likes painting cityscapes and has some great work for your eyes to soak up. Karen's blog is worth an explore. 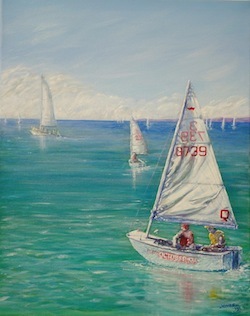 This month's post comes from a great friend of Explore Acrylics, student of life, and super Action Woman, Kathy Jonas. This is a bit of a lengthy one, but well worth the read, trust me! From Kathy: "Luffing at Norfolk Point"
I started this painting back in May with the express desire to enter the d’Arcy Doyle Art Competition. Just one of those things I wanted to experience, as I had never dared to even consider that I could do such a thing! This is that journey….. I was taking a few photos down at Norfolk Point near Manly on an almost windless day, watching the Sabot crews go through their moves. It was obvious they were really struggling to catch a breeze close into shore, and I noticed the sails spill out the air and start flapping as the crew turned the boat. This, my husband tells me, is called “luffing”. First the underpainting - gradations of colour and setting out the shape of the boat initially went well, until I discovered the perils of painting something where you can’t use artistic license. A Sabot is a Sabot, and has a particular shape and size about it. My husband is a bit into sailing (which is why he knows all about luffing) and ever so gently suggested that the boat looked a little out of proportion. After chucking a tanty I re-checked my reference photos, held up my thumb, then my paintbrush, then gave up and picked up a RULER and checked overall dimensions. Short story is that I repainted the hull and sail (after saying some nice apologetic words to my husband, who is still with me). The beauty of acrylic paint is that it hides such indiscretions, which is more than I can say about my damaged pride (I am surprised I even included the ‘bad’ photo – hope you feel privileged). At this point the painting became “Das Boat” and was the subject of many discussions over dinner! As you can see by the progress photos I have had a few changes of heart during the process. I stuck (technical term) some clouds on the horizon, softened the colour of the water – all in an attempt to make the view realistic, but feel that I actually washed things out too much. A chat with Mark after one of our workshops made me understand that we can be a bit bolder with our use of colour, especially when creating shadows, creases and folds (I’m pretty happy with my interpretation of the sails) and creating reflections in the water. There was a "captain obvious" moment when it was pointed out that the boats in the background were as clear as the main subject – so they were ‘blurred’ to ensure they receded further into the background. 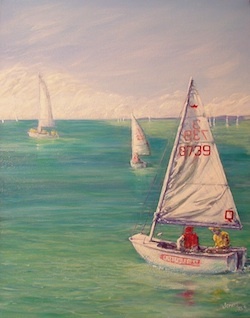 So, in late June "Luffing at Norfolk Point" went on display at the Doyles. Whilst not the best there I must say I wasn’t the worst, which was a relief. The best thing about entering was the opportunity to see what other people are doing, and to realise you are just like everyone else there – nervous and worried that people will actually like your work. It was interesting to see the winning/commended works, as this was a lesson in itself – they simply “stood out”. Size (definitely added to the wow factor), subject, composition, colour or quirkiness. Interesting. 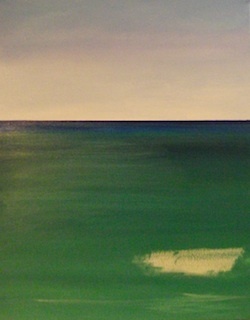 Luffing at Norfolk Point #2: Since the Doyle’s my little painting has been hanging in our hall, and I pass it daily, making mental notes about what I can do to improve on it. A couple of days ago I brought it back into the studio (aka the spare bedroom) and started dabbling again - I have intensified some of the colours, which is where I felt I had backed off initially, and added a bit more refraction to the water in the foreground, with an attempt to make it ‘come forward’ a bit more. I will leave it alone after today, and put it down as a learning experience. I feel I have learned about being braver, bolder, the need to be ACCURATE but, most importantly, that I have nothing to fear. As Mark often says, no one will die; it is only paint after all! Happy painting!" Thanks for sharing your journey Kath - such an entertaining story and so interesting to see so many of those processes we all struggle with in writing. Great job! We hope you have a wonderfully happy silly season, and see you again in 2014! I'm having a little break, so your next AA fix won't be until the 1st February. Hope there's enough to keep you going until then! 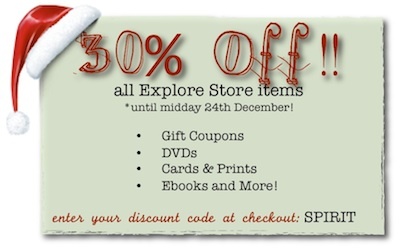 Thanks for being such a great Explorer - we really appreciate your support this year, and every year.